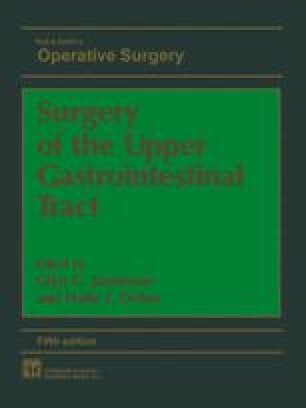 Vagotomy has emerged as the cornerstone of surgical therapy in peptic ulcer. Total abdominal or truncal vagotomy not only denervates the acid-secreting part of the stomach but also the antropyloric mechanism that controls gastric emptying. Hence, truncal vagotomy causes significant impairment of gastric emptying. It must, therefore, be combined with a drainage procedure (pyloroplasty or gastroenterostomy) to obviate the problem of gastric stasis. Although truncal vagotomy and drainage can be performed transthoracically, the procedure is more easily accomplished through the abdominal route.